All processing of requests for supplemental examination and of other papers filed in a supplemental examination proceeding and in any resulting ex parte reexamination proceeding will be performed by the staff of the Central Reexamination Unit. If the request is not granted a filing date, the Office will mail a "Notice of Noncompliant Supplemental Examination Request (37 CFR 1.610(d))" , detailing the defects in the request. See MPEP § 2812.02. If the request is granted a filing date, the Office will mail a "Notice of Supplemental Examination Request Filing Date" . The following is a copy of such a notice. 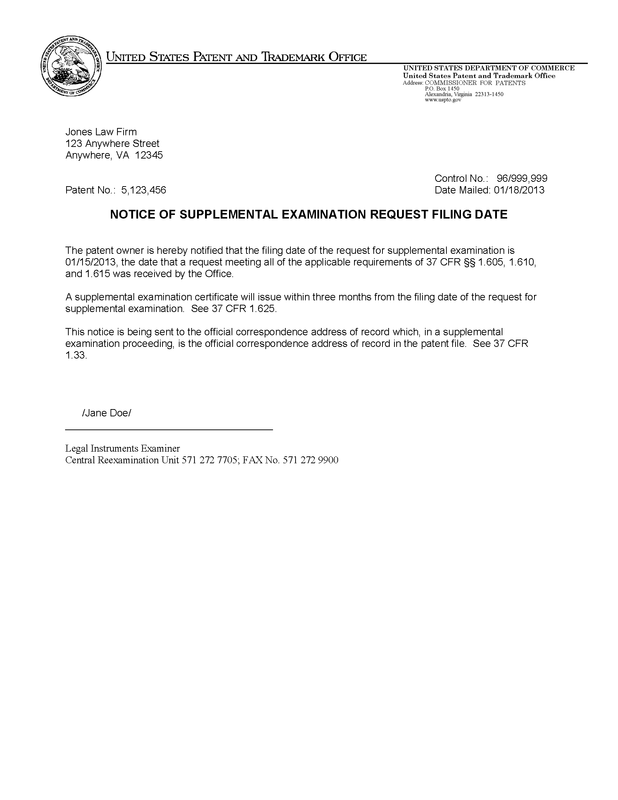 If the Central Reexamination Unit (CRU) determines that the request, as originally submitted, does not satisfy all of the requirements of 37 CFR 1.605, 1.610 and 1.615, and all other applicable rules, and is not entitled to a filing date, the CRU will mail a Notice of Noncompliant Supplemental Examination Request (37 CFR 1.610(d)) to the patent owner. The notice will be mailed to the patent owner at the correspondence address of record in the file of the patent for which supplemental examination is requested. See MPEP § 2805. The notice will specify the defects found in the request, and provide a specified time, generally 15 days, within which a corrected request may be timely filed. If further explanation is needed, an attachment to the notice will be provided specifically explaining why the request was non-compliant with the filing date requirements. The patent owner has one opportunity to file a corrected request in response to a Notice of Noncompliant Supplemental Examination Request (37 CFR 1.610(d)). To be proper, a corrected request must properly address all of the defects set forth in the notice, and must otherwise comply with all of the requirements of 37 CFR 1.605, 1.610 and 1.615, and all other applicable rules. The corrected request must include all of the components that the patent owner intends to include as part of the request, such as, for example, the request itself, copies of each of the items of information, a copy of the patent for which supplemental examination is requested, any transmittal sheet, a submission in compliance with 37 CFR 3.73(c), etc. The patent owner must submit a complete, corrected request that will replace the originally-filed request. In other words, the patent owner must not submit a “supplemental” or corrected portion of the request, because the Office intends to expunge the entire originally-filed request once a corrected request is received. For this reason, a corrected request must contain all of the required information without reliance on any defective originally-filed request. If all applicable fees have already been paid, these fees do not have to be resubmitted with the corrected request. Also, as discussed previously, even if the request (either the originally-filed request or the corrected request) is determined to be defective, the Office has the discretion under 37 CFR 1.610(d) to grant a filing date. See MPEP § 2812.01. For example, if the Office determines that a corrected request only contains one or more defects of minor character, the Office may, in its sole discretion, enter the defective corrected request, correct the defect(s) sua sponte, and/or request a submission from the patent owner in order to correct the defect(s). As a specific example, if the defect in the corrected request is limited to the omission of a copy of the patent for which supplemental examination is requested, and the copy of the patent was submitted with the originally-filed request, the Office may exercise its option to sua sponte accept the original submission of the copy of the patent as part of the corrected request. The corrected request may be submitted using the Office’s Web-based electronic filing system (EFS-Web) at www.uspto.gov, or, if filed in paper form, may be addressed to the Central Reexamination Unit (CRU), Attn: "Mail Stop Supplemental Examination" . See MPEP § 2806. A corrected request must not be facsimile-transmitted. Any corrected request may be followed up by a telephone call to the Central Reexamination Unit at (571) 272-7705 to ensure receipt. If a proper corrected request is timely filed, the filing date of the supplemental examination request will be the receipt date of the corrected request. The Office will mail a Notice of Supplemental Examination Request Filing Date to the patent owner. A copy of such a notice is provided in MPEP § 2812.01. If, in response to a Notice of Noncompliant Supplemental Examination Request (37 CFR 1.610(d)), a proper corrected request is not filed or is not timely received, or if the corrected request is defective/improper (for example, if the corrected request does not address all of the defects set forth in the notice, or introduces a new defect which was not present in the original request), the request will not be granted a filing date, and the processing of the request will be terminated. A single failure to comply with the Notice of Noncompliant Supplemental Examination Request (37 CFR 1.610(d)) will ordinarily result in the request not being granted a filing date. 37 CFR 1.610(d) provides that "[i]f the patent owner does not timely comply with the notice, the request for supplemental examination will not be granted a filing date." Thus, absent extraordinary circumstances, the patent owner will be given only one opportunity to correct the original request. When terminating the request, the Office will mail a Notice of Termination, which will notify the patent owner of the defects found in the corrected request, or of the lack of receipt, or timely receipt, of a corrected request. The fee for reexamination as set forth in 37 CFR 1.20(k)(2), if paid, will be refunded. The control number assigned to the request will be retained, but the request will not be granted a filing date, and will not be further considered. The request papers will not be returned, but will remain unavailable to the public. See MPEP § 2813, subsection II. If, after receiving a Notice of Termination, the patent owner still desires to request supplemental examination of the patent, the patent owner may file a new request for supplemental examination, which is complete and includes the missing information identified by the Office in the notice.